The Misery of Childless Marriage in Igbo Culture. Dissertation von Christogonus Onyekachi Keke, Verlag Dr. Kovač 2017, 390 S.
Infertility is a universal problem but the crisis it poses for Christian couples in the African cultural context differs from the experience in Western cultures. The root of the problem is the conflict in the understanding of marriage in African culture and the Christian marriage ethics, which makes it difficult for one to remain truly African and happily Christian in the faces of childless marriage. This work demonstrates this using the life context of the Igbo people of Nigeria as a case study. 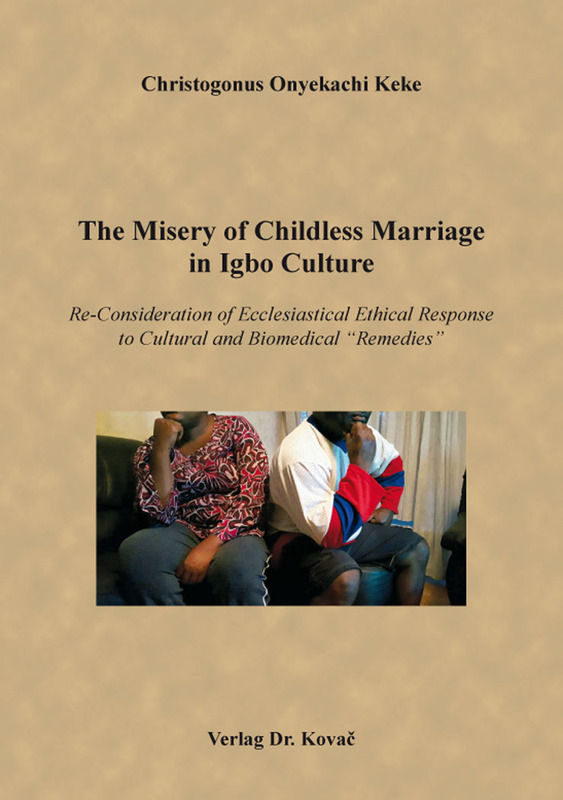 Christianity, especially the Catholic Church partakes in no small part to the pathetic ethical dilemmatic situation and misery of childless Christians in Igboland, by first generally rejecting all traditional antidotes to infertility as superstitious and now strictly prohibits the modern biomedical remedies as unethical even within marriage. Unfortunately, so many couples are caught in the dilemma – between the demands of their Christian faith and that of the culture (two important moral forces) and are thrown into confusion and misery. What then can be done to assist these suffering infertile couples since the ecclesiastical general taboo approach has been counterproductive in their specific cultural situation, with grave ethical consequences? Where does the local church come in, in regional-cultural matters of this nature? The book aims at providing new approaches to the problem of childless Christian marriage within and outside African culture. It advocates among other things – the problematization of ethical universalism and the need to inculturate Catholic moral teaching. It focuses not so much on a theoretical analysis of the arguments with which the Roman magisterium rejects without exception the traditional and modern biomedical remedies but the subjection of this position to scrutiny in relation to the practical existential predicament and situation of involuntary childless couples in various cultures. This makes the work so compelling because it successfully made an important and exemplary contribution to a genuine dialogue between African and European theology, which is fruitful and relevant for both sides and at the same time boldly suggests in the chosen concrete example a rethinking of doctrinal universalism.